"Silk Treasury: Azerbaijani Patterns of the 16th-18th centuries" exhibition opened in the Azerbaijan National Art Museum on October 18. The exposition is presented within Fifth International Symposium on Azerbaijani carpets, Trend Life reported. 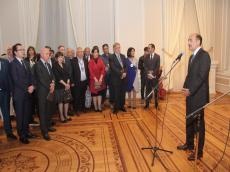 Minister of Culture and Tourism Abulfaz Garayev, addressing the event, stressed the significance of the exhibition as propaganda of Azerbaijani carpet art in the world. The curators of the exhibition-Alberto Boralevi, Chair of ICOC Academic Committee and independent expert of Azerbaijan Culture and Tourism Ministry Asli Samadova, highlighted the importance of the event not only for Azerbaijan but also for international museum practice. The exhibition features exhibits of the Victoria and Albert Museum (London) and the Museum of Islamic Art (Berlin), as well as private collections. Also at the exhibition along with exhibits from foreign museums, exhibits are kept in the Azerbaijan National Museum. The exposition is a successful result of international cultural and scientific activity. The Fifth International Symposium on Azerbaijani Carpets (ISAC 2017), titled "Traditions and Innovations" is organized in Baku on October 17-20.